Seven sizes. Mesh and white plastic handle, and dishwasher safe. 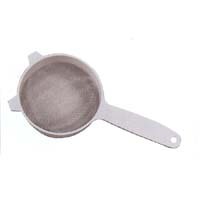 Stainless Steel Strainer 2 1/2"
Stainless Steel Strainer 3 1/4"
Stainless Steel Strainer 8 1/4"